The church has redefined discipleship into churchmanship. Living as a disciple takes intentional effort and, according to Jesus, requires us to make costly decisions. It means more than just sitting in a row in a church building or in a circle at a coffee shop or in someone’s living room. In 1 Corinthians 7, Paul repeated the same message three times … that everyone should stay in the situation he was in when God called him (vv. 17, 20, 24). The implication is that every new believer is strategically positioned by God to be involved in his mission. Often, however, new believers get the message that they are to withdraw from old relationships. Many fellow Christians have told me they can’t witness to non-Christians … because they don’t know any! They are kept so busy in the programs of the church that they never have the chance to make new friends with “those people they have nothing in common with.” This is so unfortunate, because when we become Christians, each of us is in a unique position of influence in the world. No one else has the specific opportunities that we have as ambassadors for Christ. As small group leaders, we must be sensitive to this. Healthy small groups are mission outposts where together we carry the gospel into the world in which we live. When we as believers begin to see ourselves as insiders in our part of the world–in the office or factory, in the school, in the neighborhood or apartment building, in the family–then the whole body will start working together as it should. Here’s the thing. You and I must get outside our comfort zones, and maybe even outside other people’s comfort zones, in order to become insiders where God has placed us. 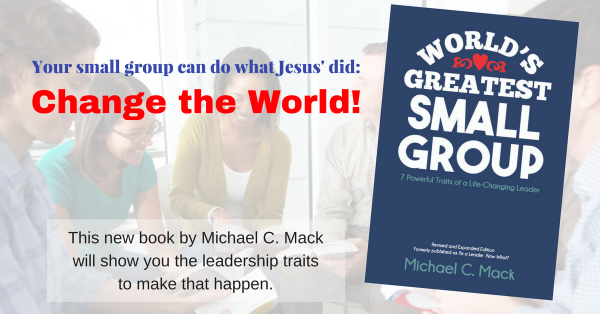 Is Your Small Group Dead or Alive? Part of this article were adapted from my first book, The Synergy Church: A Strategy for Integrating Small Groups and Sunday School (Baker Books, 1996), which is out of print. You can find copies, however, on Amazon.com and other online book sellers. I will be including sections from this book in some of my upcoming blog posts. To see more information about this or any of my other 13 books and studies, click HERE.